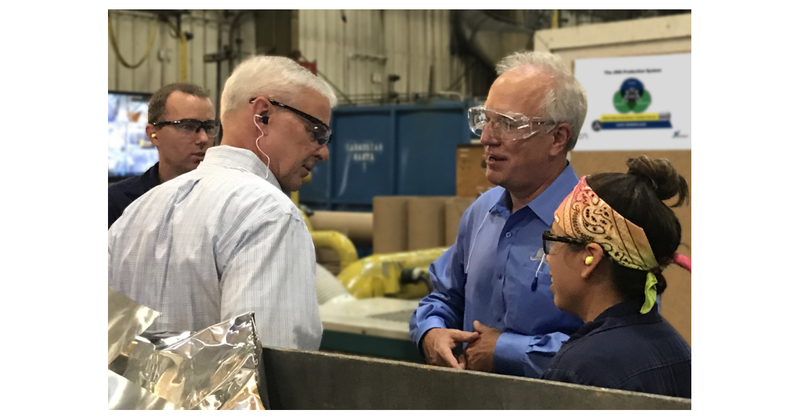 RUSSELLVILLE, Ark.–(BUSINESS WIRE)–On Monday, August 20th, Representative Steve Womack (AR-3) toured JW Aluminum’s Russellville facility and discussed issues including trade, tax cuts, the local work force, national debt and social security. During the site visit, Representative Womack participated in a presentation by JW Aluminum’s Chief Executive Officer Lee McCarter, went on a plant tour led by Russellville’s Plant Manager Mike Whitten, and met with JW Aluminum teammates to learn more about plant operations and issues concerning his constituents in the Third District of Arkansas. CEO Lee McCarter also commented, “I was personally honored to have the opportunity to present Steve, a Russellville native with over 30 years of service with the Arkansas National Guard, with a JW Aluminum WIN Culture Challenge Coin. The coin highlights our company’s Target Behavior of “We are One Team,” true to our partnership with Representative Womack.” Representative Womack, who retired from the Arkansas National Guard at the rank of Colonel, responded in kind and presented Lee and other JW Aluminum teammates with an Official Challenge Coin from his Office. “I appreciated the opportunity to see JW Aluminum’s facilities and speak with their employees in Russellville. Manufacturers providing high-skill employment are critical to the economy of the Natural State, and my visit reinforced for me our need to continue to promote the types of training and education necessary to properly prepare our nation’s workforce to take advantage of these good, technical jobs,” said Representative Womack. About U.S. Representative Steve Womack: Steve Womack (AR-3) has represented Arkansas’s Third Congressional District since 2011. He serves as the Chairman of the House Committee on the Budget and is a member of the House Appropriations defense, military construction-veterans affairs, and labor-health and human services subcommittees. Additionally, he co-chairs the Joint Select Committee on Budget and Appropriations Process Reform and is a member of the Whip Team and various caucuses. About JW Aluminum: JW Aluminum manufactures flat-rolled aluminum products including fin stock used by the heating and air-conditioning industry, light gauge converter foil for the flexible packaging industry, honeycomb foil for the aerospace industry, sheet products for the building and construction markets, as well as other sheet and foil products. JW Aluminum operates plants in Goose Creek, South Carolina; Russellville, Arkansas; St. Louis, Missouri and Williamsport, Pennsylvania. Visit www.jwaluminum.com for more information.